“Ding Dong! 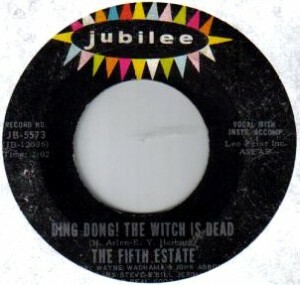 The Witch is Dead” was one of those fun sixties sunshine pop songs. “Ding-Dong! The Witch is Dead” was originally performed by the Munchkin chracers, Glinda, and Dorothy Gale in the 1939 film The Wizard of Oz. It was writte by Harold Arlen and E.Y. Harburg. Over years, there have a number of covers. One was a duet of Harold Arlen and Barbra Streisand, which was recorded in 1966. Others were by Ella Fitzgerald and Sammy Davis, Jr. 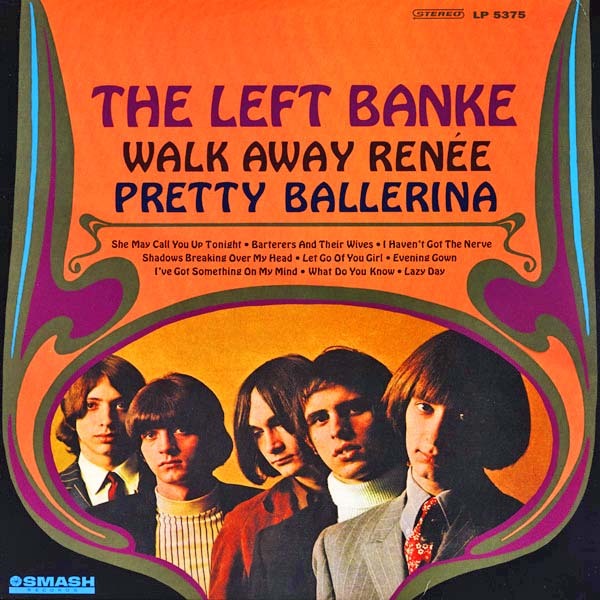 In 1967, The Fifth Estate did a sunshine pop version mixing it with the bourée from Michael Praetorius’ Terpsichore Suite (a 17th-century composition). The classical musical selection is due to singer/keyboardist Wayne Wadhams of The Fifth Estate, who had a classical music background playing in theaters around New Haven, Connecticut, to make some spending money. As odd as that might be, the was an international hit — and an enduring one at that. The song went to #11 on the U.S. Billboard Hot 100 for 10 weeks in 1967. 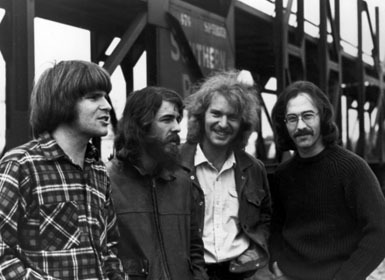 The band formed in Stamford, Connecticut, in 1963 and were known for a time as The D-Men. Members of The Fifth Estate were Rick Engler, Ken “Furvus” Evans, Doug “Duke’ Ferrara, Wayne “Wads” Wadhams, and Bill Shute. Of course, there have been lineup changes over the years. The Pass the Paisley Groove Pad is a resting stop, a place to chill out and listen to the featured song on the stereo. If the mood strikes you, click on the juke box to access and listen to the 50+ commercial free online songs there. The TV has several channels, with selections updated twice a week. Every now and then, Pass the Paisley hosts an all-request of 1960s and 1970s songs for a Be-In at the juke box in the Groove Pad. Keep on truckin’. Sometime in the 1970s or early 1980s, if I recall correctly, excerpts from the Fifth Estate’s version of this song were used in a US-aired commercial for either some kind of mop or floor-cleaning product. Does anyone else remember this, especially the name of the product? Extra-credit if anyone can produce a clip of the commercial itself!